In the last month, I have been a painting, DIY-ing, makeover-obsessed maniac. I am running out of steam. The idea was to be creative. And cheap frugal. Mostly it was an exercise in redoing--what we already had--and reusing--moving things to different parts of the house, with a few purchases here and there. Our entryway. I love that curved cabinet for so long. But the entry needed updating. I saw a picture in a magazine that had a butcher block shelf on some cool brackets. I located the exact brackets but to save money, I purchased a stairstep riser from Lowe's for $9.99 and had them cut it in half and then I stained it. Mark did the installation. Purchased a new vase, moved the candle, "W" and some wheat from another room. And voila. Our two kitchen chairs originally came from Target. Cheap--like under $50 for two of them. They came upholstered with muslin, so years ago I stapled on the red fabric. A month ago I got a yard of cool fabric from Hancocks (on sale, of course) and was able to redo both chairs. I like that they are not matchy-matchy. And my father did an amazing job of recovering this chair (with more on-sale fabric from Hancocks). I love my family photos. But I was kind of tired of the mismatched sizes. I got an idea from watching "Major Crimes" (one of my favorite shows) so I pared down the number of photos and got some square frames (on sale) from Target. One photo of each grandchild, one of my parents, and one of the whole family together (after painting the whole hallway first). The clock is from trash pick-up days quite a few years ago. With a major "oops" on the first DIY try (cantaloupe paint and ginormous numbers--what was I thinking?? ), I'm pretty happy with the green frame and chalkboard paint. The kitchen ceiling was painted blue (Valspar Sea Air). I made "modern art" for the family room--a canvas from Joann's 50% off plus some bottles of paint at 59 cents each. Big bang for little bucks. Major redo of the master bedroom.I have enjoyed the "red licorice" wall and the red and white quilt, but the room seemed crowded with furniture and I was ready for a more calm, spa-like feeling. Thanks to Kilz latex primer, covering the red wall was easy-peasy. Then I painted the entire room the same color as my sewing room, entry, dining room, hallway. Yes, I really love Valspar Oatlands Subtle Taupe, which is really a warm grey. After painting the room, projects involved rearranging furniture (free). Then I painted the headboard with Annie Sloan paint (this is amazing paint--a little pricey but you don't have to do any prep. Seriously. No sanding, priming, nothing!). Mark hung the headboard upside down in the garage by cup hooks and ropes, which made it so much easier to paint! And I felt no guilt painting Ethan Allen solid maple. I used the same Annie Sloan paint on a little bench, and spray painted a mirror frame (with spray paint formulated to cover any surface). Painted just the fronts of the drawers (inspired by a picture in Better Homes & Gardens from July 2011). New bedspread, matching (inexpensive--from Walmart's) nightstands, matching lamps with black grosgrain ribbon hot-glued on. Ta-da! There was this little log in the garage and I think I saw this idea somewhere--maybe on Pinterest. Anyway...I painted a little heart on it and put it next to our re-framed wedding invitation. Spray paint rocks--the red is gone. It is now a classy black. So that's about it. The best part was when Levi walked through the house the other day and said, "Grandma, you have a new house!" Yes, it kind of feels that way. But I'm not quite done with before and after. I seriously thought this tooth was never going to come out. She could even twist it sideways. Is it just me, or are 6-year-olds missing their two front teeth extremely adorable?? My favorite cousin's son got married (in Portland a couple of weeks ago) and they had a local wedding reception here last weekend. Fun! Back row: Terry and Cathy (my cousin)--parents of the groom, Travis and Shannon (bride and groom), Tim and Rachel (their other son--and Rachel has a cool cooking show), me and Mark. Front row: My aunt and my parents. Our grandchildren have amazing eyelashes. So really. This is basically a quilting blog. It just hasn't seemed that way lately. Because with all the DIY-ing and painting, I have had no time to sew. Although that hasn't stopped me from buying a little fabric. Ah...that's better... And now we will return to our regularly scheduled programming. You have such a gorgeous family and the house looks great, so when can I move in?! Everything looks amazing! You have some really wonderful pieces of furniture, which your updates are perfect for… I love love love it all. So fresh! Wow, I'm exhausted just looking at all that, but it looks great! Oh geez! You are one busy gal!!! SO many fun things to see here today. I do love your new picture frames! Your house looks wonderful! I love all your afters!! Your granddaughter is adorable, and yes, those toothless smiles are priceless! OMGosh....I am exhausted just reading all you have done, but it looks amazing. I love the bedroom makeover. Yes, toothless little ones are darling. They also talk funny. I love it!! Why is it that the long eyelashes are wasted on little ones? wow. You are really inspiring!! I especially love what you have done in your bedroom - all of it! And the photos of the family - love how clean and classic it looks. just awesome all around! Wow, you did good! Might I suggest a piece of artwork of some kind over the bathroom window instead of a valance/curtain, maybe even a stencil (they have nice ones at Joann's that you can stick on and peel off easily when you're tired of it). And might I ask what the quilt is hanging on - is that a DIY project, too? I love it, and the quilt! Wow! Good job! Everything looks so fresh & updated! I need to look around my house for some new ideas! I really like the new bathroom color. Maybe you can make some big, bold printed pillows for the bed like your inspiration photo? I also love the photo frames in the hall. Look at you go, girl! Wow - you have done an amazing job! I love all your DIY changes - your home looks fabulous! 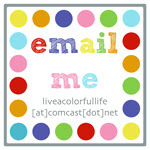 I am loving this post! Totally inspiring me! Wow! I feel like cleaning and redoing rooms in my house. I am going to clean because the sewing machine is in the shop getting the spa treatment!! If I clean now I can sew later with no regrets!! Hi! Wowzers! I like what you did with the pictures lining your hallway. I might just steal that little idea, lol! And BTW, I tried to sign up to receive your posts by email, and the pop up window says that function is not enabled. Thought you'd like to know. I love your before and afters! Obviously a lot of hard work, but so worth it in the end. Love what you did with that wall of photos! And your bedroom makeover looks fantastic! I've heard about Annie Sloan paint before and it sure sounds easy to use! Wow - you are amazing! And inspiring! Great work! I love all the changes! 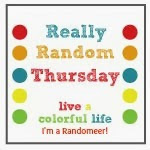 I think Really Random Thursday is my favorite day of the bloggy week. You are so lucky to have your grandbabies near you. Mine live between hundreds to thousands of miles away. It breaks my heart. I get lots of pictures, but you can't squeeze a picture. Wow, you have been BUSY! That's a ton of painting and moving and cleaning and planning. I feel tired just reading about it all. It looks great and just in time for the holidays! You are amazing! You've been busy. I love all your projects. I wish I could do that...makeover a room from a picture....paint wood....I can't do it! You have inspired me to recover some chairs I have, though. Sometime soon. :-) Sorry I haven't been able to post a random post today. Too stinking busy! I have plenty of remodel projects that need to be done here, if you have the time and want to come for a visit! Whew! I just think about projects...you actually DO them! I'm so inspired! I actually have a quart of Annie Sloan paint in the garage, brush, wax, new/old dresser to be used as my cutting table in my revised sewing room. It's all been there for about a month...winter's coming....better get moving! Thanks for the kick in the pants!! You've been going to town with the decorating projects! I hardly ever do any decorating projects, so I admire all your efforts and beautiful work. Oh wow! I've also been on a reorg binge. Haven't gotten into the painting yet, but itsa coming. It all looks wonderful, Cindy! I LOVE how fresh everything looks. I want to do a painting like that!!! How did you make it run and blend? Wow, Cindy!!! You have done amazing things in your home. Good for you for doing it for YOU! (Not for someone else, as is our case.) but I think we may have learned our lesson. I certainly hope so! I love the color you painted the bedframe. Did Mark give you a hard time about painting the wood??? It all looks so great! Love the bedroom.